Surface-enhanced Raman scattering (SERS) is becoming highly popular as an analytical technique. The use of automated collection and analysis for SERS as well as the potential for multi-sample high-throughput analysis using the DXR Raman microscope are discussed in this application note. Thermo Scientific OMNIC Array Automation Software is sued for the automated collection and analysis of multiple samples. The movement of the motorized stage of a DXR Raman microscope or the well-plate accessory of the DXR Raman microscope is controlled by the software and the stage movement is coordinated with the spectral data collection of the samples. The software includes templates for a number of multi-sample platforms such as a 96-well plate. It is also possible to create new templates using this software. The primary focus of this application note is the use of Array Automation for collecting large data sets for multiple SERS samples such as microRNA. meRIDIAN microRNA samples were used for the microRNA part of the project. The vials are shaken to ensure that the dissolution of the entire sample in water. The final solution concentration was 1 μg/μl as not all the samples had the same amount of microRNA. Each solution was separated into several aliquots and then frozen at -80 °C until required. In order to collect SERS spectra, a DXR Raman microscope provided with a 780 nm laser, brightfield/darkfield illumination, 20× microscope objective, and a motorized microscope stage was used. The samples were analyzed using 1 mW of laser power. The laser power control was very essential as it made sure that samples are not damaged by the laser during collection and the CCD detector is not saturated by the signal. For preparation of the DXR/SERS analysis kit was used for the microRNA sample preparation. 2μl of one of the aqueous microRNA solutions with 2 μl of the 70 nm gold colloid with the help of a micropipette. Two μl of the resulting solution was deposited onto one of the 12 spots of the gold slide. Before data collection, the samples were air-dried. A part of the DXR SERS analysis kit, a verification solution, was used in a preliminary test to validate that the combination of laser wavelength and gold colloid particle size offers a useful SERS response. A software template for the 12-position gold slide was designed and used for spectral analysis. A set of spectra was collected for each sample spot, with the collection set up and run using the Array Automation software. Figure 1 shows a screen capture of the set-up window for Array Automation showing the template for a 12-spot slide, with 6 spots selected for a grid collection. Using a 50 μm step from point to point, a square grid 650 μm on every side is collected. This generated 169 spectra per spot on the slide. Twelve different ink sources or pens and one red ink, three blue inks and eight black inks were collected for preparation of the samples. A paper template was created matching the size and dimensions of the company’s 12-spot microscope slide. Deposition of samples was done on specific spots by just writing on the paper. The template was attached to a microscope slide by taping along the edges. Using the standard citrate LEE and Meisel method, a silver colloid solution was prepared for SERS analysis. In a series of three microliter aliquots, a total of 12 μl of silver colloid was applied to each ink spot with specific time set between each application for samples to dry. Untreated samples were prepared and analyzed for comparison. With the help of the DXR Raman microscope, spectra of the treated and untreated samples were collected this time with a 532 nm laser 10 x objective, bright/dark field illumination and motorized microscope stage. A 2 mW laser power was used with a 25 μm slit aperture. For each sampling location 30 one second scans were collected. Figure 2 shows the average SERS spectra of three of the microRNA samples that were analyzed. In Array Automation it is possible to display or analyze each individual spectrum from a grid or the software can collect all the spectra for a sample spot and create an average, here, individual spectra were collected. Figure 2 shows there are a lot of similarities between the spectra but there are spectral differences between the samples. Certain spectral similarities are expected since the samples are made of similar nucleotides, however the arrangements of the nucleotides are what lead to significant spectral differences. Figure 3 shows the results of a 12-spot analysis and how Array Automation displays all the data points, with the squares color coded based on an analysis algorithm. One sample set was designated as a known set and one set was designated as an unknown set. The sample layout is shown in Figure 4. A spectral library was created using the standard OMNIC software. The spectra from the unknown samples were then run against the library of knowns. Figure 5 shows the result of one of the library searches. Firstly there is a high percentage match from the library search and secondly the spectra of the two samples match visually. Sample to sample reproducibility is very essential for any good analytical method. To use the spectra from the ink samples to prove that SERS is useful in the analysis of inks on paper. To develop a method for discrimination of all the inks especially those with a similar composition such as one black ink versus another. Figure 6 shows the Array Automation results for analyzing 12 ink samples on paper treated with silver colloid. Also analyzed was a set of untreated ink samples. Every spot comprises 169 spectra in a 13 x 13 grid. For SERS analysis, it is possible to average out dead spots or hot spots so as not to skew the results. Figure 7 shows the comparison of the spectral averages of an untreated ink sample versus a SERS ink sample. All the studied inks showed a similar response, a result of a dual mechanism of fluorescence reduction and signal enhancement. Figure 8 shows the average spectra for the treated and untreated red ink samples. 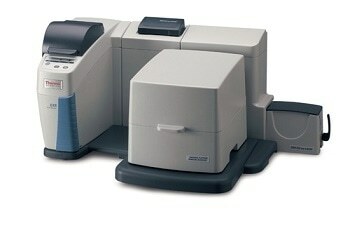 Spectra for both SERS and regular Raman ink samples were loaded into the TQ Analyst software. TQ Analyst is used for complex data analysis, especially large sets of data. It can be used for quantitative analysis, qualitative analysis, and large calibration sets. Data for ten of the ink samples were used for the chemometric analysis. A qualitative discriminant analysis method was constructed using the spectra. For effective comparison of the SERS and regular Raman data, the same parameters were used for both data sets. Figure 9 shows a principal component score plot for the untreated ink sample data, as can be seen there is not a clear separation of the various samples. The SERS spectra were analyzed using the same parameters, and a plot of the resulting principal component scores is shown in Figure 10. The most critical factor for any type of throughput analysis is the ability to automate data collection. SERS data collection has been restricted to single samples that need hands-on work of the analyst for sample swapping or analysis of new areas of the same sample. As observed from the results of the two experiments, SERS can be applied to different types of analysis, with the help of different SERS substrates. Array Automation enables the collection of a large amount of data that can be used to build spectral averages, for statistical models, or other types of data analysis. For microRNA analysis Array Automation is used for the development of a diagnostic method where samples are tested for the presence of a specific microRNA related to a disease, and for forensic analysis. The software is also useful to collect ink data to the help in the identification of different inks used on a forged document. Automated data collection by integrating the DXR Raman microscope with SERS substrate and Array Automation software add on for OMNIC moves SERS from a single sample analysis method to an automated high throughput analytical technique with a number of potential future applications. The work shown in this note demonstrates the ability of a user to prepare up to 12 samples per slide, place the slide into the instrument, collect from one up to 169 spectra per sample, and then analyze that data with a variety of tools. This can all be done with one instrument and one suite of software tools.